The original Ride Along film was a quirky buddy-cop film that was a nice change of pace from what was currently out there; however, in Ride Along 2, the plot lost it’s spark. Back in January 2014, a quirky little comedy called Ride Along, starring Ice Cube (22 Jump Street, Barbershop: The Next Cut ) and Kevin Hart (Get Hard, Central Intelligence ), came out of nowhere and quickly became box-office gold. The story was simple — a hardened Atlanta detective James Payton (Cube), is not too happy with his soon to be brother-in-law, Ben Barber (Hart), marrying his sister. To prove to her that he doesn't have what it takes, he takes "cop-in-training" on a "ride along" to show his (Hart's) true colors. Fast forward two-years and the duo are back; this time, in Ride Along 2. Ben is on cloud nine, having just graduated from the police academy and about to marry his fiancé, Angela (Tika Sumpter; Think Like a Man ). After a bust gone bad in Georgia, his future-brother-in-law, James, gets a lead that will take him to Miami to solve the case. Once again, to prove to his sister just what kind of man she is marrying, he takes along Ben for the "Ride Along" to Florida. With director Tim Story (Ride Along) wanting to up the amount comedy and dramatic characters in the sequel, he spared no expense and hired veteran actor Benjamin Bratt (24: Live Another Day), action heroine Olivia Munn (X-Men: Apocalypse) and comedian Ken Jeong (The Hangover Trilogy). While these new elements helped to round out the film, unfortunately, it couldn't save it. Ride Along 2 is one of those sequels that was green-lit solely based on the grosses of the original without having a cohesive script. The original Ride Along film was a quirky buddy-cop film that was a nice change of pace from what was currently out there; however, in Ride Along 2, the plot lost it's spark. There was no point in the film where one could say it was a "bad film", but, at the same time, you coudln't say it was a "good film" either. By the time the credits roll, it is already forgotten. For a number of years now, Universal Home Entertainment has been known to be one of the best studios around for Blu-ray transfers, and Ride Along 2 is no exception. The picture is top notch. The vibrant colors of Atlanta and Miami clearly shine through on your screen. Ride Along 2's DTS-Hd Master 5.1 lossless audio is right up to par with it's video component. Dialog is delivered with crisp sound through the center channel, while the music and special effects envelope the room around you. Ride Along With Us - A fake commercial for the Atlanta police department starring Ice Cube and Kevin Hart as their respective characters James and Ben. Behind the Scenes of Ride Along With Us - Out takes for the Ride Along With Us commercial listed above. The Ride Diaries - A seven part featurette exploring the making of the film behind-the-scenes. Kevin & Cube: Brothers-in-Law - The magic and chemistry behind the two actors, Ice Cube and Kevin Hart. The New Recruits - A quick feature introducing the newcomers to the series, Olivia Munn, Ken Jeong, and Benjamin Bratt. Inside Black Hammer Vision - Behind-the-scenes featurette into the making of the films most memorable and funny sequence. While the first Ride Along was a nice change of pace from the typical buddy-copy film, Ride Along 2 just feels like a cash grab with no redeeming plot or value. If you want to just put your mind in check for an hour an forty minutes and get a few laughs, then this is a Blu-ray you should pick up. Otherwise, pass and just watch the original film again. Download Ride Along 2 from the iTunes Store in Digial HD. 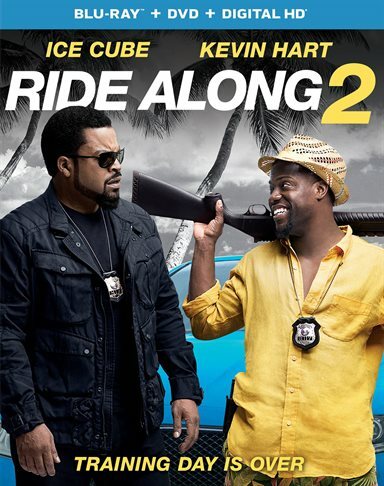 For more information about Ride Along 2 visit the FlickDirect Movie Database.